Davis Off Road Has Been Leveling Vehicles for Over 30 Years! Leveling kits are designed to do exactly what they say; they lift the front of a vehicle with a “nose down” stance to make the vehicle level. Most vehicles generally take a 2”-2.5” leveling kit to raise the front fender well height to match the rear fender well height. This is generally obtained with a simple bolt on spacer, torsion bar keyway, or in some cases a full replacement strut. Leveling kits also aid in fitting a bigger tire on most trucks. 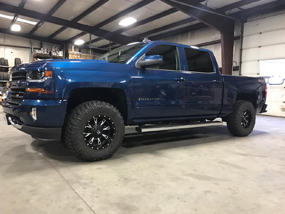 Davis Offroad carries a full line of Readylift Suspension Inc., Bilstein, Daystar, Trailfx and Procomp leveling kits which offer a wide range of vehicle fitments. We recommend a front end alignment after a level kit installation to maintain proper tire wear. If you’re looking to upgrade the stance of your truck and/or clear bigger tires, while staying cost effective - this is the route for you! Fill out our Request A Quote form below and we will be in touch to assist you in choosing the right setup for you and your truck.